A studio microphone stand that has earned a place alongside the most revered vintage microphones, consoles and outboard gear of the analog era has been reinvented for use today. George Starbird started the Meletron Corp. in Los Angeles in 1939 to manufacture radio parts. 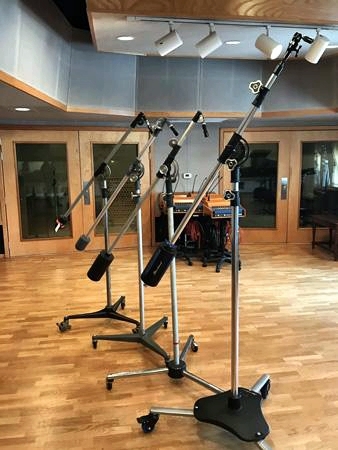 He designed the Model 180 studio boom stand for large broadcast environments in the 1940s and recording studios soon discovered its unrivaled reach, its range of motion and stability and adopted it as the large mic stand of choice. Meletron turned its focus to manufacturing pressure sensitive mechanical switches for the lucrative aeronautics, military and industrial markets in the early 1950s and ceased operations in 1970. Manley Laboratories, Inc., maker of professional studio and hi-fi audio equipment, purchased the tooling and trademark for the Model 180 in 1991 and produced an updated version of the Starbird in their California facility until 2010. Four generations of Starbird SB-1's on display at Ocean Way Studios in Nashville, with the oldest to newest models back to front. Click to enlarge. Now in its third iteration, Starbird by Triad-Orbit (T-O SB-1) incorporates patented T-O innovation to impart new levels of performance, versatility and stability to the storied Model 180 platform. Most importantly, All Triad-Orbit Starbird stand base, boom swivel and clutch components retrofit to legacy Starbird stands.